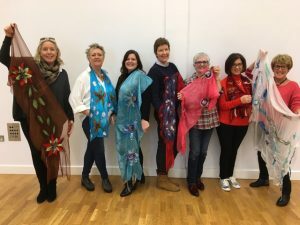 Workshops take place in a relaxed and friendly atmosphere and are suitable for beginners or those with some experience as the day can be guided to suit your skill level. Below some examples of the types of workshops I have held in the past. 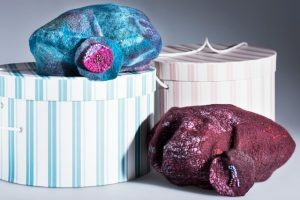 This workshop provides a useful introduction to the craft of felt-making. We will discover the types of wool to use and learn how and why wool felts. We will experiment with decorative fibres to add surface colour and texture. At the end of the day you should take home two pieces of felt suitable as a wall hanging or table mat. This workshop introduces the creation of a 3-dimensional shape. We will make a template and enclose it completely with wool fibres. We will then create stalks and attach these to the crown adding decorative silk fabrics and fibres to the surface. Afterwards the beret will be cut and moulded to fit. Wonderful hat shapes can be obtained from this simple process. 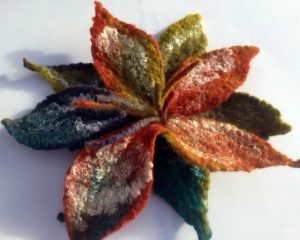 In this workshop we will make a range of simple felt pieces including cords and balls. We will add decorative effects with beads and stitching and fit appropriate fastenings to make bracelets, brooches, earrings and necklaces. We will also create and layer flower shapes adding stamens and a stem to make an elegant corsage. The only limit is your own imagination. 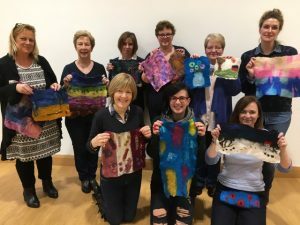 In this one day workshop we will experiment with fibres and fabrics to create exciting textural effects. We will add wool, silk and other fibres to open weave fabrics and watch how the fabric contorts as the wool shrinks during the felting process. By the end of the workshop you will have made several sample pieces and a nuno felt scarf. In this one day workshop we will make a template to form a bag. Using three layers of fibres we will learn how to incorporate useful pockets both internally and externally, as the bag is made. We will also create strong handles. 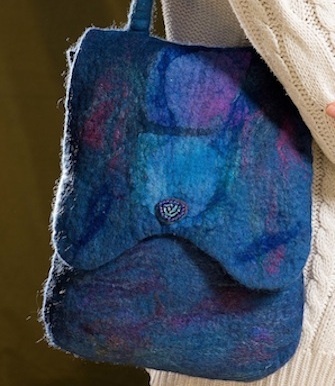 We will add fibres and fabric before felting to give interesting textures, and colour to the finished piece. In this workshop we will learn to lay out fine layers of wool fibres. We will lay out a scarf length of fibres and enhance this layer by adding silk. We will then gently felt, maintaining the web-like and gossamer fine structure. The completed scarf will have an open appearance but will be strong and a pleasure to wear. 2017 © Creative Genie Crafted with love by SiteOrigin. This function has been disabled for Jacki Sleator.